“Hey YOU! 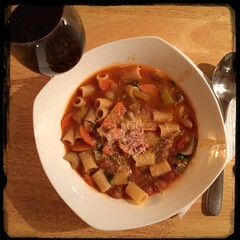 Pasta Fazool!” The Brooklyn accent mixed with the distinct dialects of Calabria and Sicily made ‘Pasta Fagioli’ sound like ‘Pasta Fazool.’ The word for ‘beans’ in Italian is Fagioli, pronounced fasúl ([faˈsuːl]) in Neapolitan, and [faˈsuːlu] in Sicilian. “Pastafazoola” or simply Pasta Fazool. This soup is one of the classic Italian soups. Built upon the bedrock of a basic soup, the soffritto which is comprised of garlic, onions. carrots and celery sautéed in olive oil. Some families make theirs as thick as a stew while others more like a soup, the Barese style is thick. Our recipe is similar to the recipe for Lentil Soup. 1. Sauté Garlic, onions and pepper flakes in Olive Oil until the onions begin become translucent and the garlic shows signs of browning. 6. Add 1 cup of vegetable (and/or chicken ) stock and let come back to a boil. 7. Once boiling, add 1 cup water followed by another cup of stock; alternate stock and water until you added a total of 1-3 cups of stock and 3-4 cups of water. Always wait for the soup to boil before adding the single cups. 8. Add lemon juice, stir. Salt and pepper to taste, and let simmer for 10 minutes before adding the pre-cooked pasta. You can add fresh parsley just before serving. 9. Serve with fresh parsley garnish and grated Romano cheese (optional).